View of Drummer Cove from deck and house. Front of house, overlooking cove. 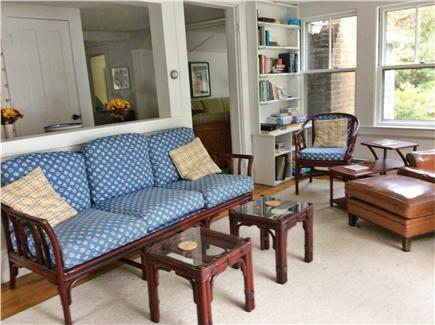 Sunroom with games, puzzles, books. Sunroom with workspace, French doors to deck. 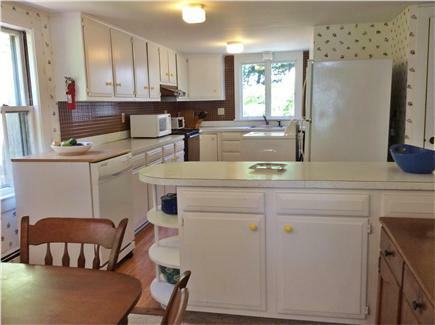 Kitchen with washer (dryer in basement) and portable dishwasher. Side yard with hammock, grill, picnic table. Ocean beach a mile away. 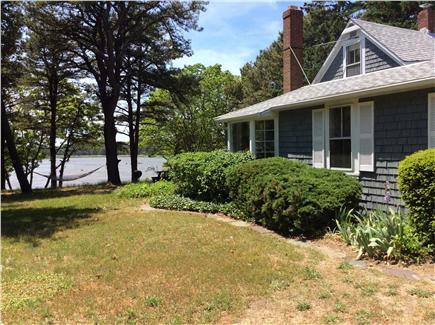 Charming Cape cottage on Drummer Cove, a tidal cove. Very private 1.5 acre lot surrounded by trees and the cove. Great water views at high tide; no swimming access. 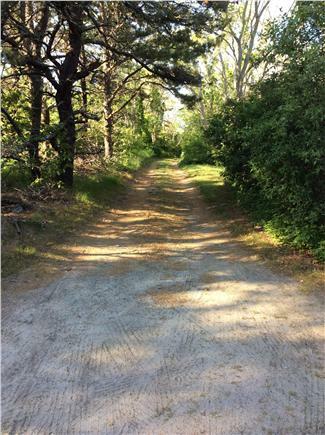 0.1 mile from the bike trail and an amazing French bakery, just under a mile to ocean beach (LeCount Hollow), and about 3 miles to Wellfleet Center, bay beaches, harbor, fresh water ponds, restaurants, and all that Wellfleet has to offer. 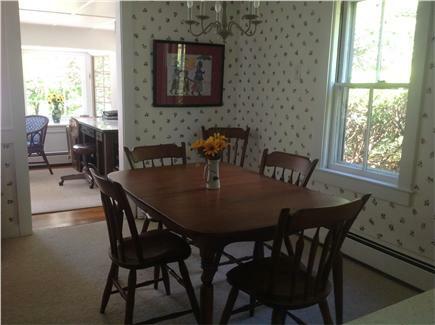 Main level has living room, kitchen, dining area, master bedroom and full bath. A sun room/family room across the front has bay windows and French doors opening to the deck and yard with spectacular views of the cove. The first floor bedroom has two twin beds put together to make a king. 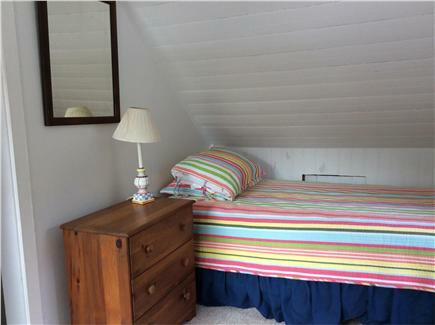 A cottage stairway leads upstairs to two small bedrooms, one with two twin beds, one with one twin bed, both overlooking the cove. The stairway landing separates the two; there are no doors between these bedrooms. There is generally a breeze off the cove, and there are fans in every room. You will find a grill and a picnic table for outdoor meals, chairs on the deck for reading, and a hammock to relax in after a day at the beach! We spent a close to perfect vacation week here this past August. Our favorite place to relax, read and enjoy the birds was right on the deck overlooking the tidal cove. The house is comfortable and welcoming. 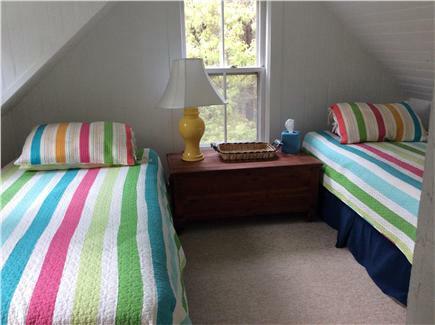 The location is secluded enough to savor the quiet but close enough to the center of Wellfleet, the beaches and restaurants so that everything is minutes away. We only wish that we could have stayed another week! 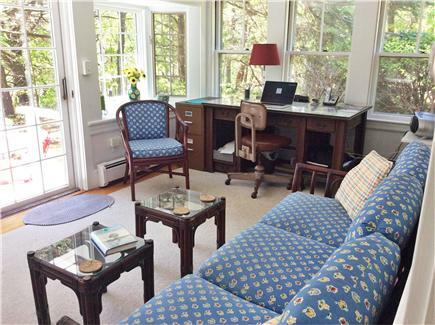 This home's location is just lovely, in a wooded area on Drummer's Cove, that is perfect for a relaxing, tranquil vacation. It was fascinating to sit in the sunroom, or out on the deck, and watch the constantly changing view as the tide drifted in and out of the cove. In the yard, we saw wild turkeys and rabbits, but not people. 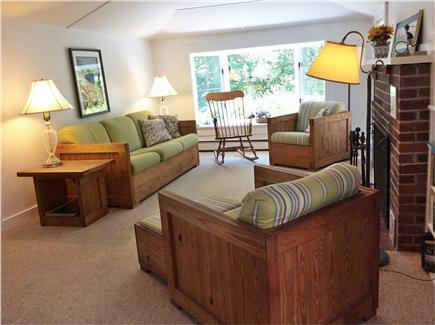 The cottage has a very private and secluded vibe even though it is right off Route 6. We love Cape Cod and especially the Outer Cape. 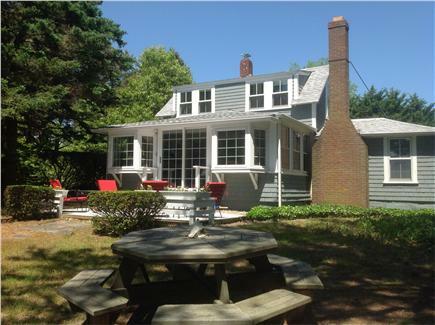 This home is in a perfect location for our annual vacation - easy distance from ocean beaches and ponds as well as the bay; walking distance from the bike trail and a famous bakery. 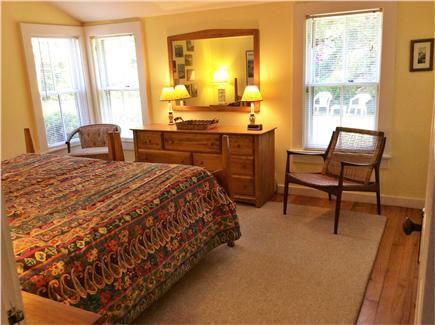 Convenient to the Wellfleet Audubon, P-town, Chatham. Sunsets while barbecuing, outdoor shower after a day at the beach, isolated setting is perfect. We have been coming here for 6 years and will continue to for many years. Let's keep Wellfleet our secret. I have stayed in this cottage multiple times, always thoroughly enjoying it and never wanting to leave. The view of Drummer Cove is even better in real life than it is in the picture. Very therapeutic to sit on the deck with a book and take in the view, hearing only the sounds of nature. That said, the handy General Store and the delicious French bakery are right across the street, and the charming town of Wellfleet is a five-minute drive away. I can’t wait to go back! 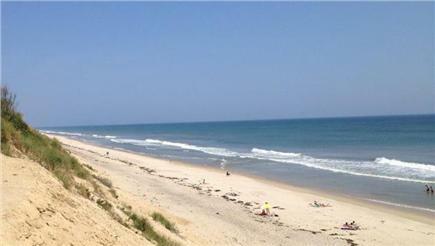 Can't imagine a better spot in South Wellfleet! Don't let the Route 6 address fool you. 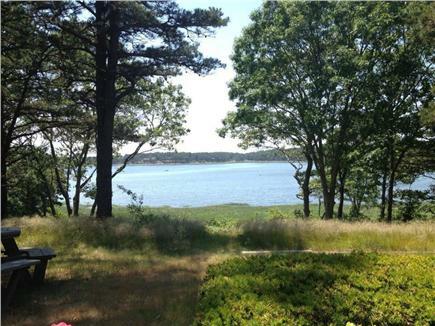 As soon as you turn up the long driveway, you'll find yourself in a private, idyllic locale overlooking Drummer Cove, a tidal inlet that changes with the tides. 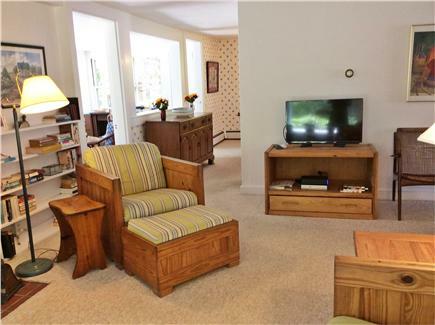 You'll feel like you have Wellfleet all to yourself with hardly any neighbors in sight. My kids and I have visited the Cape nearly every year of their lives (kids are now 15 and 13). We love the location of this cottage! It is walking distance to LeCount Hollow (a.k.a. "big wave place" with fantastic dunes and surf) and a short drive away from Mayo Beach (the warmer and calmer bay side). We love walking through the woods and across the street to the quaint general store for muffins and deli sandwiches or PB Boulangerie for pastries and coffee. Also within walking distance is the head of the Cape Cod Rail Trail, a wonderful bike trail which extends through multiple other quaint towns.